I’ve been admiring all the wood slice ornaments that have been popping up in my Pinterest feed and decided to have a go at making some. When I was on a morning walk with my husband, I saw the perfect small branch laying on the ground. I mentioned it to Murray and he said we’d bring the car back to pick it up later. Of course, we never did. A couple of days later, when we were out walking again – the branch was gone! Murray cut slices from the branch using his Mitre Saw – the slices vary in thickness from about 1 to 1.5 cm . If you don’t have a Mitre saw, wood slices seem to be readily available to buy. A Google search brings up lots of options. As some slices were quite thick I decided against drilling holes through the slices and opted to use little brass eye screws as the hangers. I drilled pilot holes with a small hand drill and a tiny (1mm) bit but if your wood is soft you may be able to screw them right in without pre drilling.. Choose some designs from your Silhouette Library and resize them to fit your wood slices. Cut them from Vinyl or similar. I used a Wood grain style contact paper. I intended to stencil a design using the contact as the stencil. Unfortunately, the grain of the wood slices was very uneven and was quite distracting behind the design, so I ditched that idea and painted the centre of the slices first to cover up Mother Nature’s uneven patterns! (Picture below is before painting) My original choice was black paint but then my daughter suggested white which looked much better, so I went with that and applied 2 coats. After painting the centre of each slice, I’d had enough of painting, (what can I say – I have a short attention span!) So I opted to stick the cut out shapes right on the slices and not bother with the stenciling. As luck would have it, the wood grain contact paper co-ordinated perfectly, it seems to really pop against the paint. I’m thrilled to be participating in The Silhouette Challenge this month, after missing a few months. The theme is DIY Gifts and I certainly think my little ornaments fit the bill. I can see a set of these ornaments making a cute gift for Friends, neighbours or co-workers. 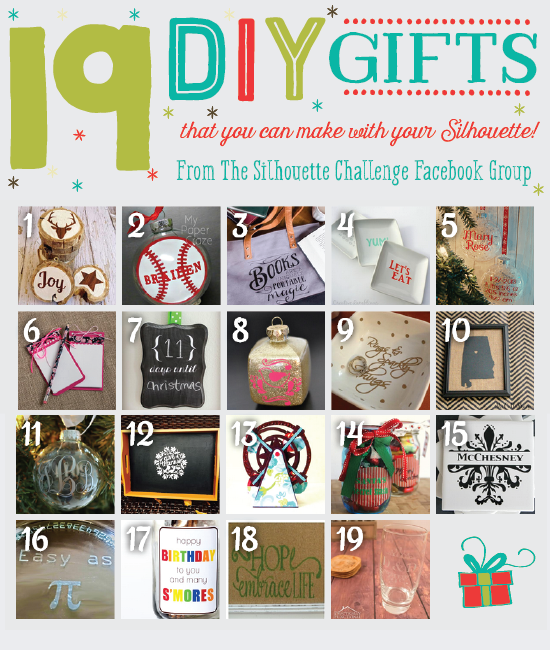 I hope you’ll join me on a Blog Hop to see more DIY Gift Projects to make with your Silhouette Cutting Machine. Just click on the click able graphic or the links below to explore all the projects. You’re not seeing double!I was featured twice on the Merry Monday Link Party! Thanks Rachel & Erlene for both featuring me. Click on the pics below to see the posts and visit the girl’s blogs. Ha Ha Thanks Holly – Yes I’m on the look out too for more fallen branches. But I’m looking at the inside too looking for a perfect wood grain – LOL – I’m getting fussy! I absolutely love these and I have a branch to do this with. Would love if you came and shared this on the Merry Monday link party. Just wanted to let you know that you’re one of my feature picks for tonight’s Merry Monday party. Love these ornaments! I am pinning this idea for later! Thanks Rachel, Apart from cutting the wood slices (which I had nothing to do with) it was a quick project. I love how your ornaments turned out! And yes, the wood-grain contact paper is perfect! At first glance, I thought you stained the wood! Thanks Emily, I love that contact paper, apart from using it as a stencil, I’ve used it on a few other projects too! It’s pretty versatile. Love these Pam! I hadn’t seen any of these ornaments and I didn’t know they had wood look contact paper. Lol I need to get out more. Thanks Glenna, Ha Ha re the contact paper – I remember when I first saw it thinking it was unusual – it was a book covering in the “Back to School” section but I think I’d rather line my shelves than cover my books in it! Wow! These are super cute! And very classy. They will look so great on any Christmas Tree! Love them! Thanks Carrie, I’m thinking about making a few more! Just had my dad cut wood slices for me. Wasn’t sure what I was going to do with them. Thanks for the fun idea! I know what I’m doing this week….. Thanks Teri, What a great Dad! Glad you like the idea Payricia. Have fun! I have a log in the garage just waiting to be cut up into wood slices like this! I have been so excited to try them. I love how your ornaments turned out – rustic and lovely. Great job! I love the story of the walk with Murray. Then your project takes some twists you do not expect and your daughter has an idea. We had to have some trees cut down on our lake home property and I was pretty bummed. I pictured a swing over the lake hanging from the tree, I am eager to get to the lake and see if any branches are left to create a memory for our Christmas Tree. Thanks for the great idea to save our beautiful memories. Your project turned out perfect. I thought you stained the designs on to the wood. Wow! Thanks Karen, Oh, your lakeside swing vision would have been lovely. I hope there’s a few branches left for you to create a memento instead. Yes, my ornaments did turn out to be a bit of a family affair in the end, The family’s very supportive of my crafts, so I guess I’m very lucky. I’m actually re looking at the couple that I painted black to see if I can salvage them! These are goregous! Pinning. The wood grain is so perfect that I did not even realize it was paper. Great job! Thanks Rachel and thanks for the pin too! Also, the colors that you used, really make it pop! Thanks for visiting Ruchira and for taking the time to comment. What a fabulous little project! I love how you adapted to make the design work for you. They really are adorable! 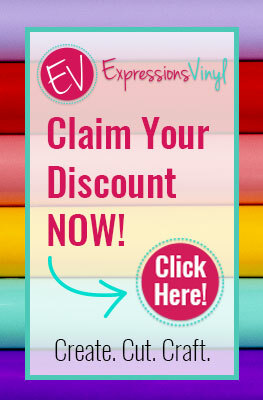 I’d love for you to share this at my Creative Ways Link Party when you get a chance. The party goes live on Wednesdays at 8pm central. Hope to see you there! Thanks for visiting Nici and your kind comments – Thanks for the invite – I’ll be sure to stop by on Wednesday. I am featuring this tonight at Merry Monday tonight at 9pm EST. Grats and hope you can join us again this week! Thanks Michelle. I linked up again – Thanks for hosting! Pam, these are fantastic! When I first saw them, I thought you had stained them. The contact paper worked fantastically! Thanks for sharing such a great project! Thanks Kristy. Glad you liked them! Hi! Love this idea and am going to make them for my class of kindergarten kiddos as gifts. Just want to clarify…you just stuck the contact paper on and didn’t seal it or anything? Doesn’t seem like it would stay on. I haven’t ever used contact paper or vinyl on my silhouette so I’m not sure how it works. Yes Jen, It was that simple – no sealing or anything – just stuck the contact straight on the wood.